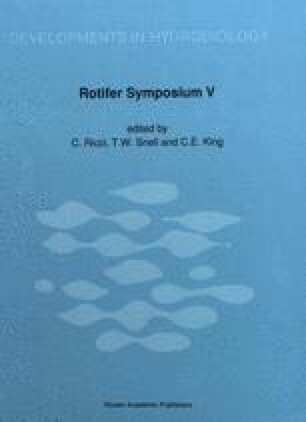 A review of temperature and salinity effects on rotifer population dynamics is presented together with original data of these effects for three clones of Brachionus plicatilis. There is a clear relationship between temperature and the intrinsic rate of increase, r: an increase of temperature — within the natural environmental range — produces an exponential increase of r, and the slope of the response depends on the genotype. The effect of salinity is also genetically dependent; the highest r for each clone is observed at the salinity close to that of its environmental origin. The response of r to temperature is mainly a consequence of the response of the individual rates of development and reproductive timing. The effect of temperature on fecundity (number of descendents per individual life time) is negligible when temperature values are within the normal habitat ranges. On the other hand, salinity seems to affect primarily fecundity. The interaction salinity-temperature may be important in clones or species living in fluctuating environments with positive response to the more frequent combinations found in the corresponding habitats.